As I walk up from the Oakland subway station on a Sunday morning, rain is falling in a slow drizzle and the downtown street is deserted. Around the corner, I spot the “Tropicana Ballroom” sign on a 1920s building that is my destination. I pay $15 at the entrance and walk up the red-carpeted stairs to a ballroom where art deco wall sconces softly glow onto an 8000-square-foot floor full of dancers warming up. On the far side of the dance floor, beneath floor-to-ceiling windows, an altar has been laid with candles, a vase of gladiolas, a statue of Shiva, and Osho Zen Tarot cards. A young woman sits cross-legged in meditation in front of the altar; the man next to her is kneeling and praying; and two hundred other dancers—ranging in age from infants wearing padded ear coverings to men and women in their 70s—are preparing to “sweat their prayers” on the dance floor. In cities across the United States and Europe, school gymnasiums, yoga studios, community centers, old warehouses, and ballrooms host the growing ecstatic dance movement based on self-described “urban shaman” Gabrielle Roth’s “Five Rhythms,” and shaped by the electronic dance music scene. Since the 1997 publication of Roth’s Sweat Your Prayers: The Five Rhythms of the Soul, ecstatic dances have emerged in an urban context of experimental theatre and raves, and incorporate strands of the New Age movement. 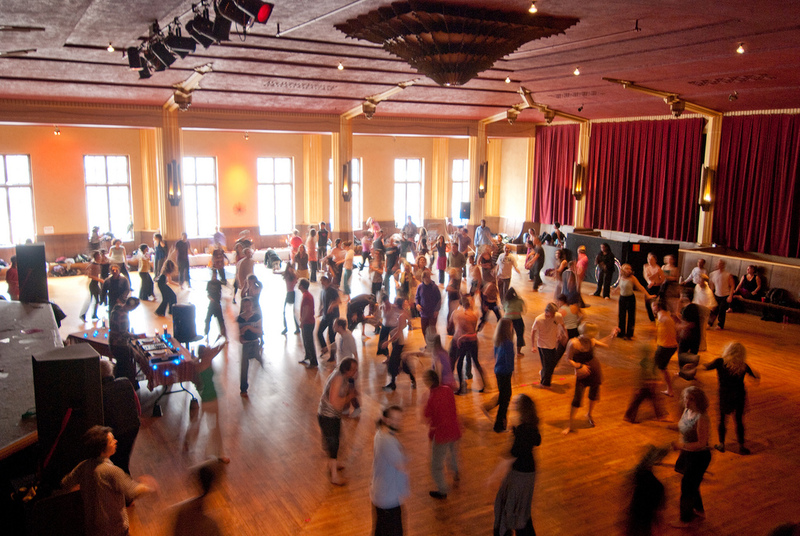 In Los Angeles, Oakland, Dallas, New York, Amsterdam, Berlin, and many smaller cities and college towns, “Silicon Valley Shamanic disco,” “Sacred Groove,” “Barefoot Boogie,” “Ecstatic Sunday Mass,” “Soul Sanctuary Dance,” and “Soul Shake Dance Church” attract dancers of all ages for whom movement is a prayer and the dance floor an urban altar. Described on the Five Rhythms community’s website as “an antidote to city life,” dance worship has, nevertheless, been powerfully shaped by the urban context in which it developed. Dancers carry their urban lives with them into the dance and take the dance back out to city streets. Although dancers transform these spaces into temporary temples of movement, dance floors still carry hints of their other lives. Oakland’s Tropicana Ballroom was once “Sweets Ballroom,” opened in 1929 by brothers William and Eugene Sweet, who loved to dance. It featured acts like Count Basie, Duke Ellington, and the Benny Goodman Orchestra, as well as Latin jazz and Mexican bands that played for families on Sunday afternoons. In the late 1990s, theologian Matthew Fox’s “Techno Cosmic Masses,” which combined sermons with dance and music, were also held at Sweets. Now, every Sunday morning, Ecstatic Dance Oakland hosts dance worship for participants from across the Bay Area. The dance they encounter at the Tropicana is, as one dancer puts it, “medicinal herb. Battery. Prayer. Breath.” Still, traces of the ballroom’s elegant past linger and heighten the sense of being in a city with a rich musical history, yet far away from the gritty streets outside. Through visual effects and sound, ecstatic dance events encourage prayer by setting apart the dance floor as a sacred space, separate from the surrounding urban environment. Across the San Francisco Bay from the Tropicana, on Saturday evenings, ecstatic dance organizers cover the Mission Dolores Academy gymnasium’s basketball hoops with bright banners, and place strings of LED Christmas lights in a colorful perimeter along the edges of the basketball floor. By decorating unexpected worship spaces in this way, ecstatic dancers signal that these gyms and ballrooms are serving a different purpose: this is not a high school basketball game, nor is it salsa dance night. Next door to the gym, Mission Dolores—the oldest mission church in California—has a permanent altar adorned with a crucified Christ. But at Ecstatic Mission, the altar is temporary: this week, a Buddha painted on cloth is draped above candles and tarot cards. There is usually no structured prayer at ecstatic dance events, but temporary altars created for each dance provide a visual focus for dancers’ prayers. The Mission dance organizers prepare an altar each week as a “safe space to sit and reflect, to meditate, or pray as you wish.” Individual dancers may pray in front of the altar, or even sit and pray in the middle of the dance floor while others spin around them. Altars may include flowers, plants, candles, tarot or medicine cards, images of Hindu deities, goddess figures or the Buddha, a picture of someone who has died or is going through a healing crisis, and sometimes fruit to share. These smaller sites of focused prayer within the larger space draw on familiar religious idioms and help to further obscure the ordinary nature of the space. Ecstatic dancers also distinguish their events from other types of electronic dance by contrasting the purity of ecstatic dance spaces with the impurity of nightclubs and the urban landscape. Ecstatic dances are open to anyone; they have no structure and no steps to learn, but they do have rules: no alcohol, no drugs, and no talking on the dance floor. DJ Sweat Miracles explained to newcomers in a morning circle at Soul Shake Dance Church that there is no talking because the dance floor is “a place for the body and the heart to have their own language” (Field notes: Soul Shake Dance Church, Chico, CA, 23 February 2014). Street shoes must be left outside, and though dance shoes and socks are usually permitted, bare feet are preferred. These guidelines make it clear to dancers that the space should be free from impurities brought in from the street and their bodies clear of substances that might block their prayers. Music is an important tool in the work of making over ordinary spaces into sanctuaries of sound for free-form worship. Although dance churches usually have no leaders, ministers, gurus, or priestesses, DJs like Sweat Miracles, Medicine Heart, Baron von Spirit, and Yogi are responsible for two hours of non-stop music. Often described as a “wave,” the music starts slowly, builds to an intense bass-heavy beat, and ends in silence as exhausted dancers fall to the floor in devotional poses. While some DJs may also cycle through clubs and music festivals, on the dance floor they are shamans of sound, tasked with taking the room of dancers to a state of prayerful ecstasy. Sound, which includes not only music, but also chanting, whistling, cheering, and laughing, is also an important element of dance worship. As Isaac Weiner points out in his 2013 study Religion Out Loud, “how religions have sought to make themselves heard has always been at least as important as what they were trying to say.” At ecstatic dance gatherings, sound joins movement to generate dancers’ prayers, which are as likely to be a yell or twirl as a word or thought. All of these strategies make ecstatic dance events attractive to dancers who have rejected other religious options. One Sunday at Soul Shake Dance Church, a young mother who brought her two sons to dance told participants sitting around the “closing circle” that she had felt uncomfortable taking her children to other religious spaces, and was grateful “to be able to pray without having anything forced on you” (Field notes: Soul Shake Dance Church, Chico, CA, 10 March 2014). There is no explicit religious or spiritual identity linked with ecstatic dance. Dancers are Buddhist, Christian, Jewish, Pagan, agnostic, and “spiritual”: many of them fall into the “nones” category. But dancers transpose the religious experiences they grew up with—and may have practiced elsewhere—onto ecstatic dance sites. They bring their inner histories with them: memories of childhood experiences or religious services they visited, images of other people’s gods, blessings, and prayers from their families or other traditions. Because dance communities are eclectic and inclusive, images of the Buddha or Shiva on ecstatic dance altars generally seem to stand in for “deity” or “spirit.” Dancers praying at the altar may be praying to Buddha or God, but are, just as likely, praying to no one in particular for an ill friend to be healed, for the safety of a son joining the military, or for guidance on their own path ahead. Some dancers report that angels and spirits visit them while they dance. But more commonly they describe prayer as an expression of the inner self or “divine self” through movement. In these ways, prayer in the ecstatic dance context moves from the inside out. Dancing becomes an extended prayer that is an outward expression of an inner devotional process. Dancers’ sweat and movement are the prayer; prayer itself is the point, not to whom is prayed. As Roth explains in her book: “to sweat is to pray, to make an offering of your innermost self. Sweat is holy water.…The more you sweat, the more you pray. The more you pray, the closer you come to ecstasy.” Dance may be an offering of self, but it is also a devotional prayer to self, to a self that is both transcendent and embodied. Ecstatic dancers emphasize their ancient roots in shamanistic traditions that they believe captured this blend of transcendent ecstasy and embodied prayer. They look backward to a primordial past of tribal belonging and, at the same time, embrace notions of “church,” and modern technology in the form of elaborate sound systems, mix tapes, and a lively Internet presence on Facebook, Twitter, and other social media. Humans “have always danced,” says the founder of Los Angeles based “Fumbling Toward Ecstasy,” connecting her “sanctuary for movement” to its roots. Dance churches are fast becoming sites of self-definition among “spiritual but not religious” Americans. At these sites, new media forms, such as blogs and Facebook, converge with ancient religious symbols and newly-invented rituals to create what one dancer refers to as “cathedrals of flesh.” Sweat, sound, whirling, leaping, shimmying, shaking, skipping, and writhing are among the many prayers that dancers offer up at these new urban cathedrals.